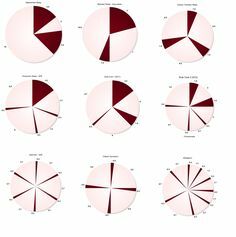 Siesta sleep schedules are the most common of the polyphasic schedules, involving sleeping in two separate segments throughout the day – once at night, and a nap in the middle of the day. There are three distinct biphasic schedules, the ‘power siesta’ schedule which involves sleeping for 20 minutes in the middle of the day and between 5-6 hours at night (varies between invididuals), and the more common ‘long siest’ involving 4.5-5.5 hours at night and a 60-90 minute sleep during the day, and of course segmented sleep (which we won’t talk about in this article). In regards to health, there is enough scientific data to say that this method of sleeping is better for your health, and leads to improved mood, decreased stress, increased alertness and productivity over a typical monophasic schedule. Likewise, both biphasic schedules have been shown in scientific studies to significantly aid in learning and cognitive functions. As an added bonus, in terms of the most waking time gained per nap taken, biphasic schedules are the most efficient. Or a 20 minute nap! There is nothing saying a 20 minute nap is better than a 90 minute sleep in the middle of the day. Napping for around 20 minutes is healthy. And sleeping for 90 minutes has lots of benefits, and are especially great for athletes. But also napping for 90 minutes, too late in the afternoon, can impact on night time sleep. So this is why we sleep within 7 hours of starting our day! Scientists have long wondered if this sleepiness was caused by the midday meal, but although insulin change does seem to play a role in sleepiness, there is a large amount of evidence that biphasic sleep is much more natural than sleeping monophasically, and the midday energy drop is driven by our circadian rhythm far more than our eating habits. There are natural core temperature changes that are controlled by our circadian clocks which prepare our bodies for a sleep-like state. A nap exaptation can be beneficial for a 20 minute power-siesta schedule, to regulate one’s ultradian rhythm, training oneself to nap efficiently. The 90 minute sleep schedule can take a few days or a week or two to get used to if you have no napping experience, but can be easier for some people. The longer you try to nap in the middle of the day (and if you do not drink caffeine) the easier it becomes to nap and the better quality it will become. Naps can increase Growth Hormone Secretion. Growth Hormone Secretion helps to maintain normal body structure and metabolism, including helping to keep blood glucose levels stable. Naps can promote wakefulness and enhances performance and learning ability. Naps early in the day do not negatively impact on night time sleep. very interesting. But siestas in England? No way. If only I could make this work with my job! We only get a 30 minute break in the middle of our shift. How much flexibility does this sleep pattern have? Does oversleeping on the weekends have a big impact on your sleep schedule or is it no big deal? And my core sleep is 1.30am – 7.30am, what should I do when I go to sleep later like around 3pm? Still wake up at 7.30 and do my 20 minute nap or wake up after 6 hours of sleep? Or should I wake up at 7.30 and nap for 90 minutes? 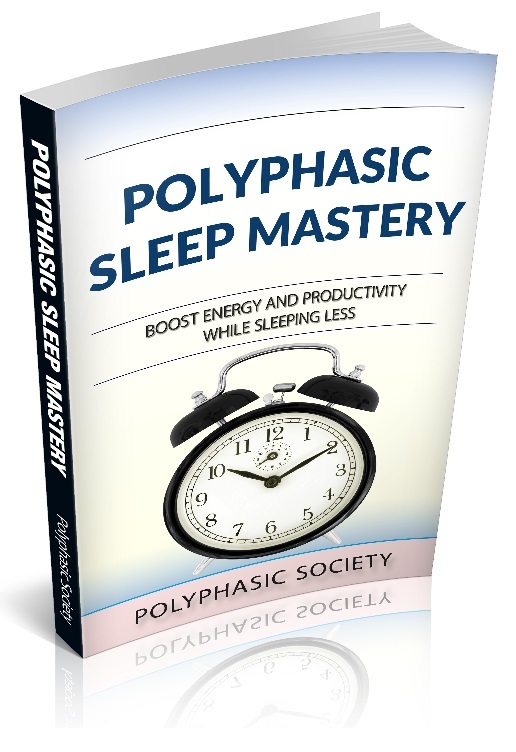 Rule number one for polyphasic sleepers: don’t stray from the schedule. Especially if you’re in the adaptation period. I always try to have a siesta and live in the UK. I nap for around 45 minutes. Not sure why this article says it must be either 20 minutes or 90 minutes, surely somewhere between the two, depending on what suits you? I fall into a proper sleep and wake up feeling refreshed, happier and ready for the rest of the day. Actually, the article is pretty correct. If you take a nap longer than 30 minutes then you’ll likely fall into deep sleep. While not necessarily a bad thing, if you don’t fully finish your deep sleep period, then you’ll wake up and be more tired. However, ninety minutes is about the average sleep cycle, so by sleeping for ninety minutes you are getting deep sleep, but not waking up in the middle of deep sleep. 20 minute naps are ok to because you never go into deep sleep. For a 9 to 5 job, would siestas be too late at 5:30 like when we get home? I wake up just before 8 and it seems like napping should be done around 3. There’s nowhere to lie down at work it seems. Even when I get 5 hours, I can’t stay asleep for 20 minutes in my naps. I can probably get a fragmented 5 minutes in half hour. I have insomnia. As mentioned by the author, a siesta taken too late can impact on your night sleep badly. If you can’t take the siesta near midday, maybe a dual core sleep is more appropriate for you. The twenty minutes and ninety minute calculations are for actually being asleep, correct? So if It takes me around 10 minutes to fall asleep, I should set an alarm for 100 minutes from when I begin to lay down, correct? No, your should follow schedule strictly. Taking too much time to fall asleep or to wake up is normal during your adaptation period that can last for even months, but if you keep trying to follow your schedule perfectly, like a robot, at some point your body will get used to it and you’ll be able to control when to sleep and wake up easily. Also if you stick to the same pattern for enough time you will not even need to set an alarm anymore. The thing I didn’t understand is why we should either take a nap for 20 and sleep 5.5 max or take a nap for 90 and sleep 6 max? Can’t I take a nap for 20 and sleep 6 hours? I’m kinda confused and I want to learn and use these information so I’d be glad if someone helps. Each sleeping pattern is designed to never put you in a sleep deprivation condition and the amount of sleep needed is relative to the size of each awake phase and the previous sleeping phase, therefore if you distribute you sleep differently the minimum amount of total sleeping hours changes as well. This combined to the fact that having more sleep than you need not only gives less hours in your day but also can backfire in some cases making you fell more tired, makes me believe that each schedule have an ideal amount of total sleeping hours that should be respected if you want increase your chances of adaptation to that particular pattern. I do this all the time. I sleep 4-6hrs a night and take a nap for 30-90mins. I have been living like this for god knows how long no ill effects. actually it feels very natural. I have been naturally biphasic most of my life if my schedule allows. Right now I sleep from 11:00pm to 5:00 am. Then I come home from work and nap from 3:00pm to 4:30pm. It works for me. Can I alter the time in between naps from what’s shown above? I.e., could I sleep for 6 hours, then have a 90-minute nap 8 or 9 hours later? I’m in school, and I’m trying to account for the fact that I need time in the morning to get ready, then spend six hours in actual classes, and often stay late by about an hour or so for clubs. Basically, could I go to sleep at 1 AM, wake up at 7 AM, and nap from 4-5:30 PM? The minimum is 20 while the maximum should be 90, anything in between depending on the person is acceptable if you’ve read this article correctly. The 3.5-6 hour core should have some weight on judging your nap later, but you do what feels best to you, and should take time to discover what works best. I feel a 4.5 hour core with a 30min nap later is more than enough for what I do. Currently, I’m switching back to siesta again, and remember what worked best for me the first time around. Remember, these aren’t exact requirements, but a guide as to how it best works keeping in mind that everyone is different. Play with it, see how little hours you need to sleep at first, increase your nap time if you have a short core time, and visa versa. Sometimes people sleep 4 hours with a 20min nap and it’s more than enough or 6 hours and 1.5 nap. In short, find what works best for you, and go from there. What would you recommend for someone with my work hours, 6:00am-2:30pm. I’m confused mainly on what to do about naps, by the time I get home and am ready for a nap, it would be probably 3pm. Isn’t that too late for a midday nap? Would that affect my nighttime core sleep? I sleep 12am – 06am and take a nap around 1pm. But what if I accidentally lost time and go to bed at 3am for example? Should I sleep till 9am or just wake up at 6am? And what about naps and probably sleep deprivation? When I went to South Africa and Botswana last year, we had a siesta everyday around noon during the hottest hours of the day. I had never taken naps in the middle of the day before, but after several weeks, I found myself or more alert and mentally happy than I’ve ever been in my life before. I continued the habit when I got back to the States, and I feel overall more relaxed and less stressed then I used to. The schedule we used was a core sleep of 10 pm to 5 am and a 90 minute nap anywhere between 11:00 and 1:30. If I have to wake up at 5:30 a.m. every week day and don’t get home until 3-4 p.m. what time should I take my nap and what time should I have my larger chunk of sleep? Waking up from your main sleep within the sunrise is better (there’s your circadian rhythm and stuff) , but if I find myself having to do something that will prevent me from taking my siesta around noon for a while, I simply move my main sleep to another time. You could for example put your main sleep between 16 to 21 PM and your second sleep between 4 to 5:30 AM. Perhaps you happen to have social life unlike me, so off course it might not work for you. But since it was no big deal for me I think anyone in the same situation could try this solution as well. I have a question. You mention several times that the nap is in the ‘middle of the day.’ Yet you also say the nap must start within 7 hours of waking up from the night core sleep. With my schedule, if I sleep 11 pm to 5 am, I would have to nap around 1 pm (which is 8 hours). This is because I’m busy from 7:50 am to 12:45 pm. Or would it be better to sleep 10 pm to 4 am, wake up for 3 hours, then nap from 7:10 to 7:30 am in the morning? It’s within 7 hours, in fact. it’s only 3 hours. You say it’s better to go to bed early, rise early, and nap early (4 am to 2 pm). However, this 20 minute nap is not in the middle of the day, it’s at 7 am. All of the siestas seem to be around noon. Which schedule would be better to do? Thanks so much! 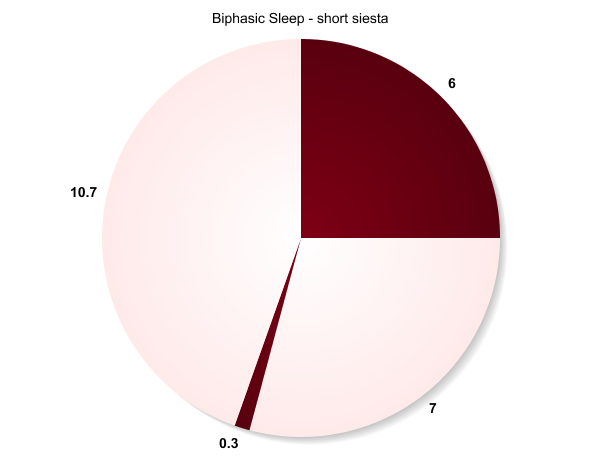 I’m looking forward to trying biphasic sleep! I love napping! Hello. 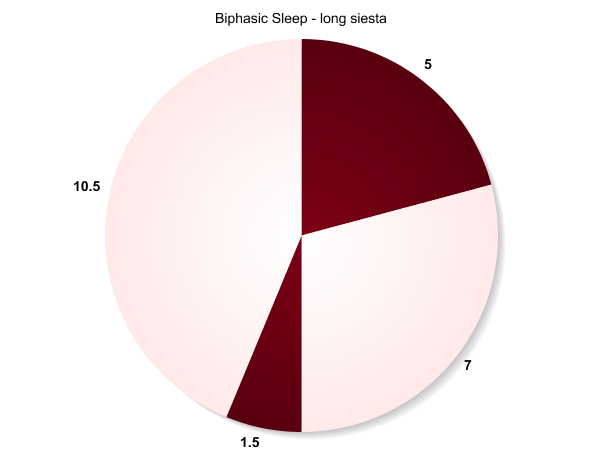 How to use the polyphasic sleepy beta app to put Siesta sleep in pratice? Tanks. i work 12-8, would a good schedule for siesta be 11-530 with a 1040-11 nap? I was experimenting with segmented sleep during winter and initially enjoyed its benefits but as the days grow longer it is becoming increasingly impractical because of the difference in day and night temp, so I am going to try a siesta schedule to try and sleep through the hottest part of the day. Should I anticipate trouble with the transition? I figured it would feel somewhat natural because it matches the seasonal transition. I reverted back to 8 hour sleep for the past couple weeks and now its not working for me because its already hot when I wake up. I want to maximize time spent in cool weather when I actually want to do stuff. I have a question.. I Sleep from 3.30am till 8.30am, so I placed my nap at 2am (that’s the best time to nap according to the napwheel). So when I wake up I clean the house and then I have to work till 14pm. But what if I suddenly have to work overtime till 4pm? Should I just ignore the 7hrs rule and nap after 4pm? Any ideas? I always wake up by myself after about 5h30 core sleep, and if I don’t wake up by myself, then my alarm wakes me up after 5h30 sleep because I’m in my light sleep (I use a smart alarm). I have the feeling my sleepcycle are a bit shorter than 1h30. Is this enough to do just a 20min nap or should I take a 90min nap? I wake up naturally after 5h30 core sleep, and if not, then my alarm wakes me up because I’m in my light sleep (I use a sleeptracking app). I also have the idea my sleepcycles are shorter than 1h30 and I think that’s the reason I wake up after 5h30 core sleep feeling rested. Is this enough sleep? Or should I take a 90min nap instead of 20min? What to do if you’ve been sleeping at the wrong times for a long period of time and trying to get back to your regular schedule like before? I find it almost impossible to fall asleep on the right time since ive been doing so way late for a long time. Hello, I am transitioning to a short siesta sleep cycle. I come back from school at 4:10, and was wondering how this looks. Core: 1 – 7 a.m.